Our experiment platform offers the possibility to automatically calculate participant payoffs and provide the results in a printable format. Participant payoffs can be accessed through the Reports tab in the Session Details of each Session. 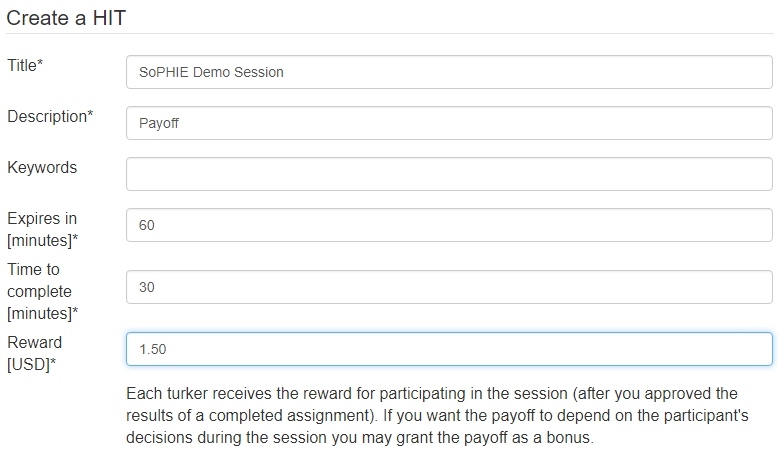 To determine the payoff of the participants based on the results achieved during a session, there are several methods already implemented in SoPHIE to calculate the amount. The methods below can be found under Edit Treatment for each of your treatments. If the Use Payoff Script method is chosen, the Payoff Script right below the Retrieval method may be taken into account. This script will be performed for each participant individually. In here you can calculate the payoff in any way you like. Just keep in mind that the variables $payoff and $moneyPayoff need to be named that way. The $payoff represents the performance of a certain participant, whereas the $moneyPayoff is the actual money a participant receives after applying a conversion rate. The method Sum of participant payoff variables (PE, PS and PSL) uses all variables named 'payoff' in every participant context and sums up their values. This sum equals the participants payoffs, so the naming convention for the variables is required to get to a correct result. Within the last method the Value of participant payoffSum variable (PE) is used to determine the participants payoff. Therefore, calculations for a summary of multiple, partial payoffs need to be done within the experiment.